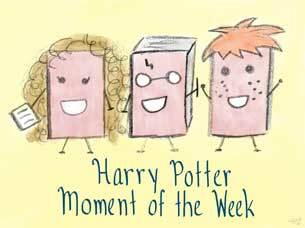 Rally the Readers: Harry Potter Moment of the Week (28): Deathly Hallows: Wand, Cloak, or Stone? Harry Potter Moment of the Week (28): Deathly Hallows: Wand, Cloak, or Stone? Deathly Hallows: Wand, Cloak, or Stone? Out of all the Deathly Hallows, the one that I would want to have is the invisibility cloak. This preference comes more out of avoidance of the other two Hallows than anything else. The wand comes with a huge target. Who would want that? I would be too paranoid to have the wand in my possession. The stone is no better. Why would you want to mess with the natural order of things? In my opinion, that is just asking for trouble. The invisibility cloak would be a very cool thing to have. You can see how useful it was for the Golden Trio, and it didn’t even come with any sort of consequences. No one in their right mind would turn down an invisibility cloak, lol. Sheer avoidance of the other two seem to be a big factor in everyone's choice. And who wouldn't want to prowl around the restricted section of Hogwarts' library?! Haha, I'd probably be stumbling and making tons noise if I ever tried to sneak around in the cloak. Great question this week! I would pick cloak.. only because I would already have a wand. And I agree about the stone. Yeah, I'd be too attached to my own wand to want a different one. I don't like change, lol. I would totally try to use to cloak to explore, but I'd most likely get caught, lol. Even in the Tale of the Three Brothers, the cloak is the superior choice because it allows the brother to leave Death without being followed. I never really understood why one would need all three hallows to be the master of Death when one could avoid it with the cloak?